Experience chocolate treats so new, exciting and delicious—non GMO dark and milk chocolate toffee almonds infused with Matcha Green Tea or Rooibos Red Tea! 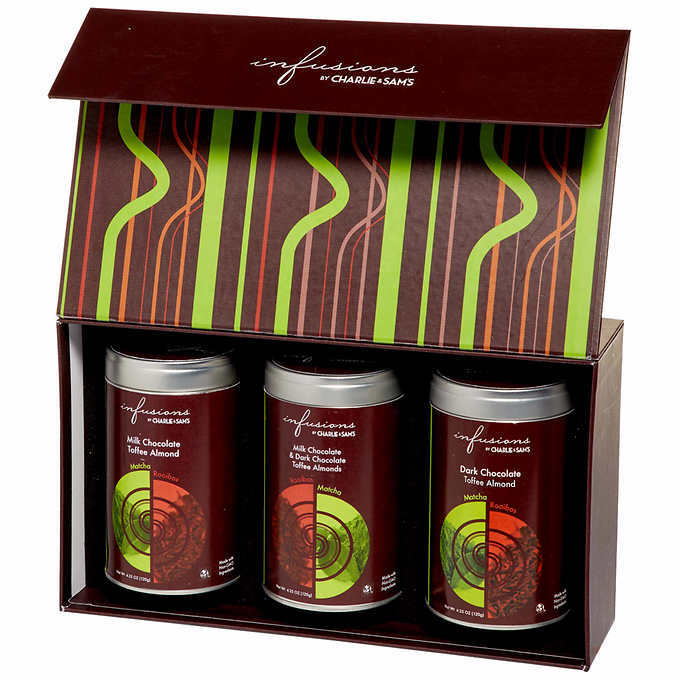 Each crunchy organic almond is enrobed in toffee and quality velvety chocolate and then triple infused with high grade Organic Matcha or Organic Rooibos producing a product that has a delightful tea green tea colour or red tea colour. The tasting profile is subtle yet unique tea flavour –something quite extraordinary and not to be missed. You don’t need to be a tea lover to love this chocolate confection! Beautifully designed tins come in a matching gift box—perfect for home and office gifts as well as anyone who enjoys tea or sweets!